It's so great to be able to take fresh veggies out of your fridge and throw them all in a stir-fry. There's really not much limit to the variations you can create. Lettuce might be the only thing I wouldn't recommend stir-frying. Even beets can go in! First we browned some sliced mild Italian sausage. 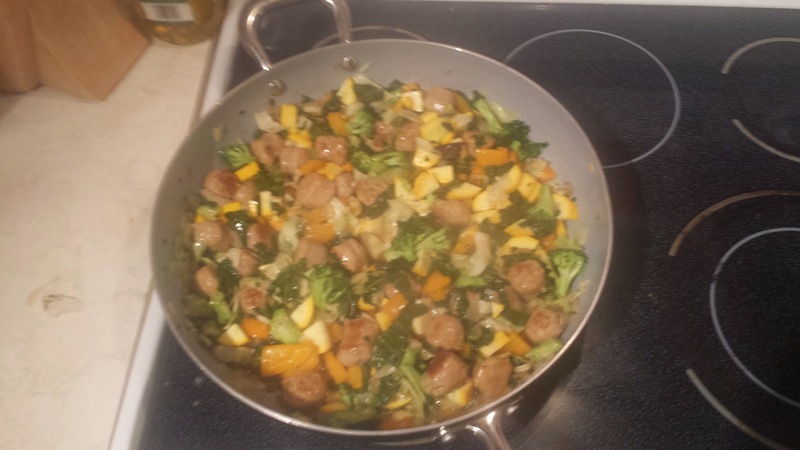 Then put in a large diced onion, then sliced 1/2 green cabbage (unused from a stir-fry I made last week), then a whole bag of de-stemmed and chopped kale, then chopped sweet pepper, then chopped broccoli, then quartered and sliced yellow zucchini. Almost everything from RJR Farm. I could have put Swiss chard and beets but I didn't want to go overboard, the pan was getting pretty full even after the greens cooked down. I try to guess the longest cooking ingredients to the fastest cooking and put them in that order (eg. mushrooms always last). For the sauce I made my mother's specialty, and my favourite. Take a couple spoonfuls of vegetable or chicken bouillon (powdered broth), a couple spoonfuls (roughly the same amount as bouillon) of corn starch (or corn starch alternative), put several glugs of soy sauce, then add cold water and whisk until it turns a light brown colour. Adjust to taste, and quantity can be adjusted depending on size of stir-fry. Generally you want just enough to coat the ingredients and maybe a bit extra for your rice or noodles. Season as you like, there's fresh garlic in this version, fresh basil, pepper. Then we served it over brown rice with sesame seeds sprinkled on top for an extra health boost. With the time it takes to cook the rice - about 45 minutes, you can do all your chopping and frying and even clean some dishes. 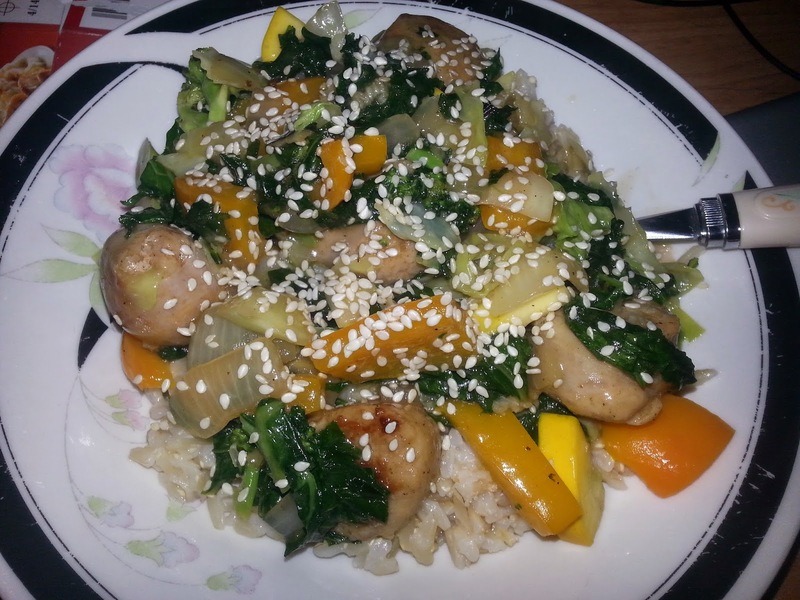 Served over rice and garnished with sesame seeds. What's your favourite stir-fry recipe?